Donald Trump has just bought a huge McDonald’s buffet for a college football team, while much of the country struggles to get by during the longest ever government shutdown. Clemson University’s football team were visiting the White House on Monday (January 14) to celebrate their win over Alabama in the College Football Playoff National Championship. The team were promised a dinner in the company of the president, but seeing as though much of the White House staff are currently on leave due to the shutdown, options were limited. 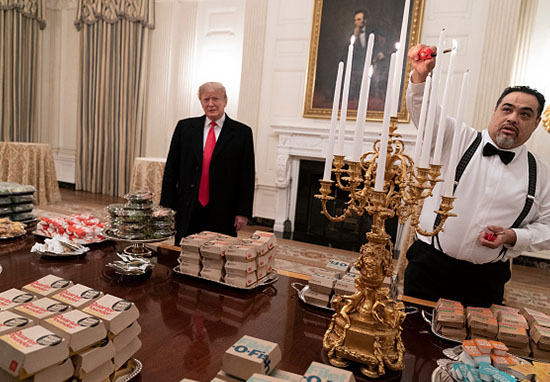 As such, Trump decided to serve the players ‘their favourite food’ – which he believed to be a range of fast food, including McDonald’s, Wendy’s and Burger King. CNN reports that Big Macs, chicken nuggets and Filet-O-Fish were all part of the spread, as well as pizzas and French fries. And of course, Trump made it perfectly clear that this was all paid for by the man himself. Because of the shutdown, you know we have the great Clemson team with us, the national champions. So we went out and we ordered American fast food, paid for by me. Lots of hamburgers, lots of pizza. We have some very large people that like eating. So I think we’re going to have a little fun. Just in case you had any doubt about who paid for the meal, the deputy press secretary Hogan Gidley also emphasised the point that it came out of the president’s own pocket. Oh, and he also blamed the Democrats for the continued government shutdown – so any football player disappointed with the buffet can blame them, I guess. The President wanted to host a fun event to celebrate the College Football National Champion Clemson Tigers. 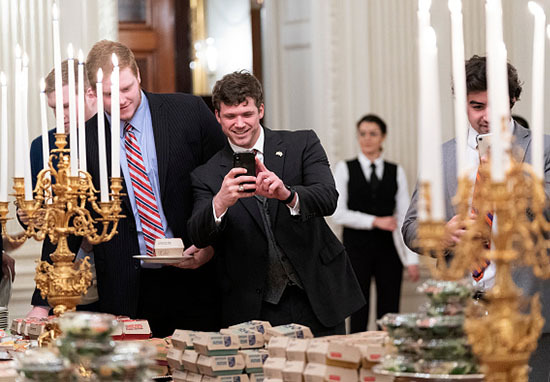 Because the Democrats refuse to negotiate on border security, much of the residence staff at the White House is furloughed – so the President is personally paying for the event to be catered with some of everyone’s favourite fast foods. 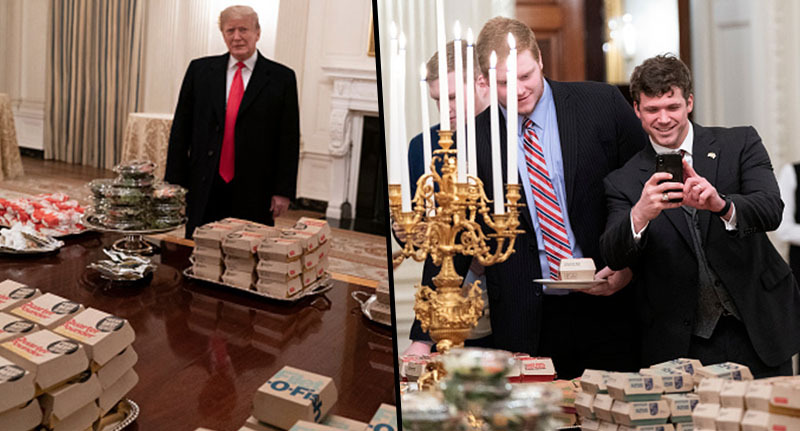 Standing behind the table of fast food, Trump was filmed by White House Correspondent Hunter Walker referring to the dinner as ‘great American food’. When asked whether McDonald’s or Wendy’s is his favourite food, the president replies: ‘if it’s American, I like it. It’s all American stuff’. He then goes on to say he doubts much of the food – including ‘300 hamburgers and many, many fries’ – will still be here once the football team had left. Trump’s last ditch attempt at hospitality has raised the eyebrows of many around the world and even some of those in attendance at the White House. One Clemson University athlete was caught on camera during the fast food buffet saying ‘I thought it was a joke’ in a video that has been viewed almost 1 million times (at the time of writing). The players should be thankful they got the feast at all, because the Daily Mail reports that Trump initially wanted to give them salads which he had made by himself. Nah, just kidding – course he wouldn’t make them himself, that’s the wife’s job (eye roll). I had a choice: do we have no food for you, because we have a shutdown, or do we give you some little quick salads that the first lady will make along with the second lady, they’ll make some salads. And I said, you guys aren’t into salads. As America enters its 25th day of government shutdown, hundreds of thousands of federal workers are forced to stay at home – meaning the White House is operating with minimal staff. Those who usually cater such receptions are therefore unable to, hence the buffet of fast food instead of a five-course lavish dinner. But as long as the president gets credit for the feast, I suppose that’s all that matters in his eyes.